Season the pork chops with salt & pepper. Heat the olive oil in a large skillet on medium-high heat. Cook pork chops two minutes on each side. Remove from the pan, place on a dish and cover with aluminum. In the same skillet, add the butter. Add the red onion and garlic. Sauté 3 minutes, adding the thyme and additional salt and pepper (to taste). Add the sliced apples and sauté 3-5 minutes until apples are almost tender. Add the brandy; stir. Add the light cream; stir. Add the pure maple syrup; stir one final time. Shared this recipe on Fiesta Friday – go check out some great recipes and ideas! Perfect! 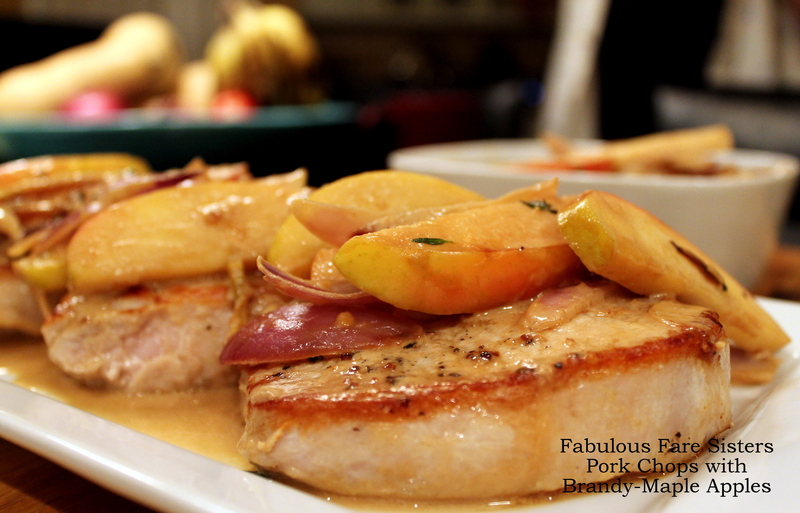 Those pork chops look juicy and tender and the apples gorgeous! OMG – the perfect way to add pizzazz to pork chops! I love all apple-based recipes. Do you ever marinate your pork chops in brine before cooking, to maximize tenderness? Gorgeous! Absolutely stunning those apples – it never occurred to me to serve them as a savoury side. Thanks for enlightening me! Absolutely! They have my name on them! This is absolutely mouth watering gorgeous. Would love to eat it. I love the mix of flavors! South Jersey: Delicious Orchards? I’m up in Montclair. Nice recipe! N.